The Red-billed Blue Magpie is a species of bird in the crow family Corvidae. It is about the same size as the European Magpie but has a much longer tail. 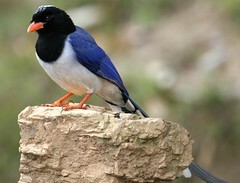 The Red-billed Blue Magpie occurs in a broad swathe from the western Himalayas, eastwards into China and Vietnam in evergreen forest and scrub in predominantly hilly or mountainous country. Food is sought both in trees and on the ground. It takes the usual wide range of food, such as invertebrates, other small animals, and fruit and some seeds. It robs nests of eggs and also chicks. The Red-billed Blue Magpie nests in trees and large shrubs in a relatively shallow nest. There are usually three to five eggs laid. Vocal mimicry is very apparent in this species and its calls are very varied, but the most usual are a grating rattle and a high pitched whistle a little like a flute.